Out on the edge of the Catalina Mountains, just north of Tucson, lie the remnants of another world. Amid the scrubby trees and towering saguaro cacti, a series of gleaming white towers, glass superstructures and geodesic domes rise from the desert. Inside this somewhat alien artefact, teeming jungles, saltwater oceans and vibrant coral reefs once nurtured an incredible array of life, including eight human beings, on a miniature planet completely separated from our own. 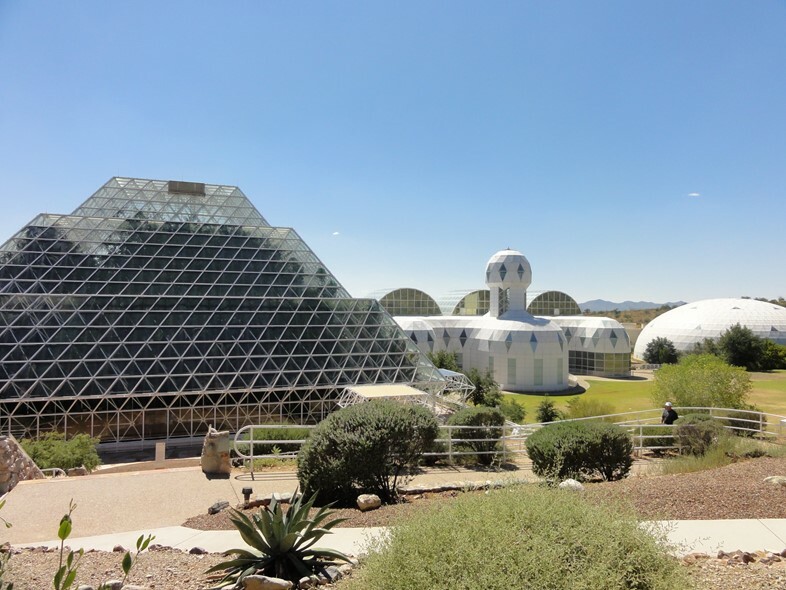 Biosphere 2, as it was named to mark it out as different from our own biosphere, was built in the late 80s and operated as a closed system between September 1991 and September 1993 with eight ‘Biospherians’ living inside. Created to simulate the Earth in miniature, the installation featured a rainforest, an ocean, a coral reef, savannah grasslands, mangrove wetlands, a fog desert and human/agricultural areas spread throughout 12 thousand square metres of physical space. An artificial river flowed through the various habitats, providing moisture for the rainforest and savannah areas before emptying into the marshes and ocean. 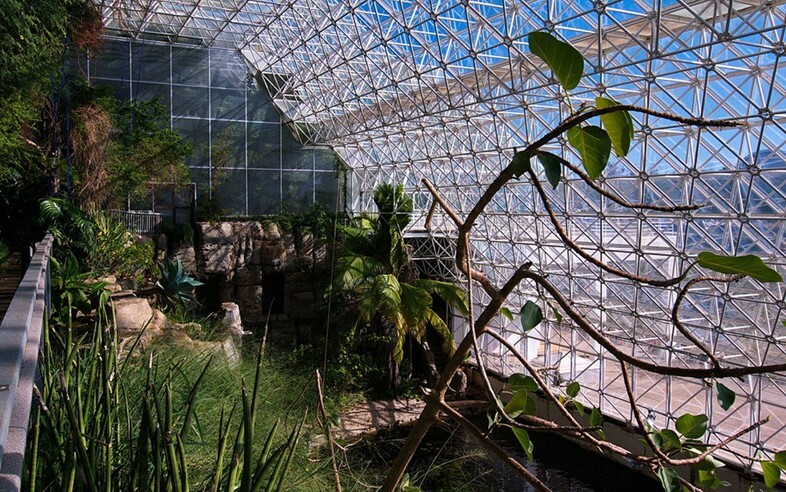 Designed by an associate of legendary architect and designer Buckminster Fuller, Biosphere 2’s futuristic glass and steel-tubed greenhouses were populated with hundreds of different species ranging from hummingbirds and bees to fish, turtles and termites. Sealed off from the ground below by a stainless steel tank, the entire system existed initially in complete isolation, with the first human habitation tests starting in 1988. Like some future spacecraft set down in the desert, the tiny planet and its occupants then travelled into the unknown, studying new ways to live inside a closed loop and learning more about just how hard that is. Things got a bit, let’s just say, complicated during the second mission and the human side of the experiments came to a dramatic end but the facility itself journeyed on, first managed and owned by Columbia University, then threatened with demolition and now safe in the hands of the University of Arizona. It has also been the subject of one of the Institute of Ecotechnics’ various art-science projects, conducted in biodomes around the world. Today, it serves as an educational facility for kids and college students alike, and a testbed for researching biology, botany and climate change. One of the biggest projects is LEO: the Landscape Evolution Observatory. Built where the agricultural areas used to be, its three sloping rock faces form the largest Earth science experiment in the world. Each is filled with volcanic rock and is fitted with sprinklers, sensors and other features which allow researchers to simulate and observe precisely what happens to sloping plant communities as weather patterns shift – something that’s becoming ever more crucial as our world warms and changes. Among the other experiments and research currently being conducted are studies in how rainforests respond to drought, a timely collaboration between Mexico and American scientists on arid regions and a project on bringing degraded coral reefs back to life. 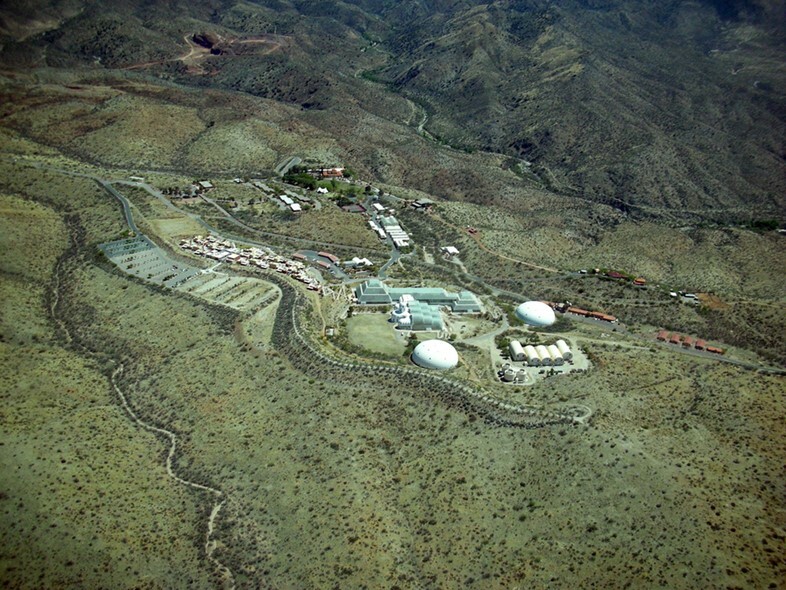 It’s a fitting experiment given all the upheavals the facility has been through, with Biosphere 2’s once-thriving coral reef slowly dying and now, like the original dream, starting to thrive once again. 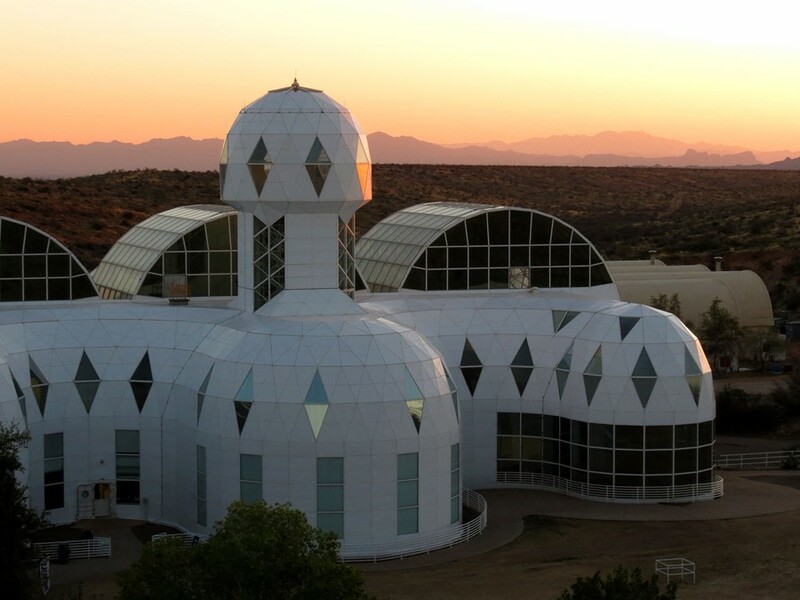 super/collider will be visiting Biosphere 2 as part of their upcoming expedition to witness the total solar eclipse in America – which also includes stops at Joshua Tree, Meteor Crater and the Grand Canyon. Click here for more information and to book a place.